Here is the inoyi tree in the yard. This is view from my porch looking west towards the mountains/hills. Things here are no longer dramatically new although I am occasionally startled by odd events I observe around me. For example, as I was sitting on my porch, reading, a while ago, a pickup truck (bakkie) goes whizzing by on the dirt road by my house. Two young boys from school were standing up in the back and they waved to me. I waved back. Tied onto the back of the truck by a long rope was an entire dead cow, horns and all, bumping and scraping along the road! It was probably on its way to a BBQ feast, a braai, and was to be the main attraction for this culture of meat eaters. My life is entirely undramatic at the moment. I have a daily routine for my 5 days of teaching life, separated by very long, mostly alone, weekends. My host family is small now that the wonderful 12-year-old left for boarding school. They are gone all day Saturday at church. 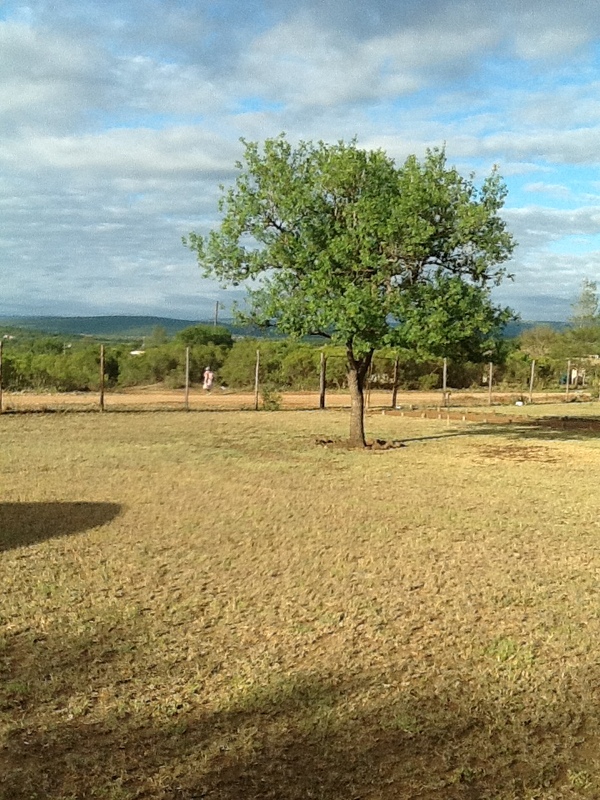 Sometimes I will have a lovely overnight visit with some volunteers who live 8 km from Manguzi. Sometimes I will go to Jozini to shop or go to the library. There are Peace Corps rules on how often you are allowed to be away from your site on overnight visits. As you might imagine, this rubs me the wrong way! I am 69 years old and being told where I have to be and when I can go! As they say here, Eeesh! I usually wake up around 5 am (after a restless night) to the sound of roosters crowing and a peacock screeching. I put on my robe and filthy crocs, move aside the bucket of water from last night’s bath, take my chamber pot (small white plastic bucket with a handle) and roll of toilet paper, and walk across the big yard to the latrine. As I sit inside the outhouse, I think about how many more days I will have to use this facility and when might be the next time I will get to be in a bathroom with a flush toilet and shower. After using the outhouse for the purpose for which it was intended and emptying my chamber pot into the pit, I go back to my little house. These days I take my previous night’s bath water out to the garden and water my baby plants. I save all water I can for this purpose. We are having a drought! More about water later! Here is my baby garden at 4:00 p.m. in the afternoon in 90 degree heat. I am out of extra water and it is drooping badly. 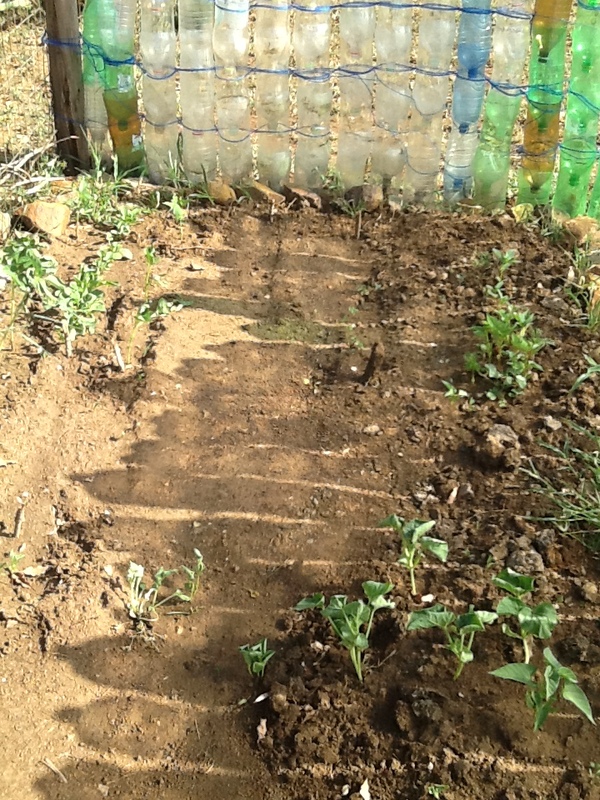 It grows extremely slowly because the soil is bad and there is not enough water. The fence, however, has miraculously held together and kept out the big critters. Back in the house, after closing off my soda bottle garden fence with a pile of branches, I prepare breakfast. I usually have granola and yogurt, instant Nescafé coffee and milk, one malaria pill, and one multi-vitamin, courtesy of the Peace Corps. The malaria is required (or you get sent home) and the vitamins were free for the taking. I read and eat. Right now, I am reading “After Mandela, The Battle for the Soul of South Africa” by Alec Russell. I then get dressed in a skirt, blouse and sandals, pack some food for break time, brush my hair and teeth, and go out the door. I walk to and from school, 2 km each way. I walk with the children along the sidewalk, the one you all saw in an earlier blog. I say “Good Morning” to the children (they need to hear English) and “Sawubona” to any adults I pass. At school, I have a newly delivered desk in the office/admin/library/meeting room. I share it with the HOD. I keep my textbooks and notebooks in a cabinet. I can work at the desk when I am not teaching. I teach 13 hours/week. I teach English every day to Grade 5 and Grade 7 for one hour each day. I teach Social Science to Grade 6 for 3 hours/week. I have a “reduced” teaching load because I am a Peace Corps volunteer. The average teaching load for intermediate phase (4-7) is 20 hours/week. I have lots of breaks! I also have lots of learners (the South African word for students). There are 65 kids in Grade 5. There are 40 kids in Grade 6. There are 51 kids in Grade 7. It is too many but there is nothing that can be done about the overcrowding. We have no empty classrooms. No portables are on the way. No classrooms are being built. So far, I have taught a few weeks. I have had good days and not so good days. Sometimes I remember why I retired from teaching! Some days, the kids are well-behaved, engaged and doing their work. I marvel at their ability to be crammed three to a desk and still do anything productive! Some days, especially when it is 90-100 degrees outside, they are loud, disruptive and can’t be settled. Then, I wish I was somewhere else entirely. South Africa uses a set curriculum, CAPS, with lessons and standards and pacing all set out clearly and carefully. The lessons themselves are not bad and there are some interesting stories and activities. Teachers can even chose their own stories but don’t do that usually because the student texts/workbooks are easier to use. The problem as I see it is the pacing. Every two weeks you are supposed to cover so much set curriculum (Reading, Writing, Listening, Speaking, Grammar). There is too much and it goes too fast and there is NO time for reinforcement or review or tests or projects. And if you are in a meeting or assembly and your class time is cut short, you just don’t have enough hours to cover what you are supposed to cover in those two weeks. You can get “behinder and behinder” unless you are very careful. Obviously, you are just not going to get to it all so you have to pick what you think is most important. You also have to document what you didn’t cover! Every day we have a half hour of silent reading time, on the daily schedule. It takes 15 minutes to get the books and settle down to read, ten minutes of almost quiet reading time, and then the books are collected and put away. The time, in reality, is not always used for reading, but for teachers to get missed curriculum taught or reviewed. 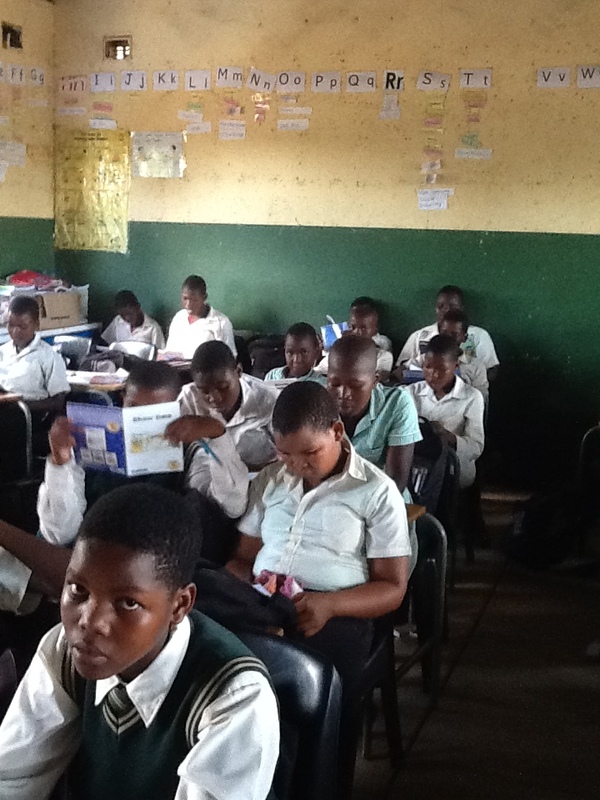 This photo shows some of my grade seven learners. Here is the most difficult problem: my students, except for a handful, do not work at their grade level of the CAPS curriculum. Their English skills are still quite low, especially Grade 5. They have only had one year of all-English curriculum. Grade 4 is the transition year. So I have them in Grade 5 just after their first year of English, in a group of 65! I am trying to make the work accessible to them. But the pacing is nuts for new English speakers! I have my work cut out, getting them ready for the standardized tests. Teach to the test anyone!?! School is out most days at 2:45 and on Friday at 1:30. Teachers and staff are out the door, in their cars, and driving away within 5 minutes of the children leaving. It is a ghost town! I was astounded at first since in the States we stay and prep, have meetings or workshops and sometimes go to Whole Foods for coffee and a scone (OMG that would be wonderful). Meetings here are held during school hours with children in the classrooms unattended. I walk my 2 km home and fill the afternoon with watering my garden, studying isiZulu, reading, playing Solitaire, doing crosswords, chatting online with other PC volunteers. Then I make some semblance of a dinner (usually a salad if I have lettuce, with tuna fish) and watch the news on TV at 6:30. Then I read, prep for school, play more games on my beloved iPad. I heat up 3 cups of hot water in my electric kettle, mix it with cool water, and have a bucket bath. Sometimes Sue calls me all the way from England! Sometimes Ian calls me all the way from Oakland! I go to bed by 10. And start all over again the next morning. I spend some time wondering if I will be able to last the entire 27 months. It has now been 7 months. Four volunteers have quit for various reasons within the last 30 days. More may quit. Who knows? I have asked a few other people. The explanation is similar but with the added element of fear. There is so much corruption involved with construction projects that people are afraid to open their mouths and complain because they might be hurt or killed or some other bad thing might happen. There is money but somehow it “disappears.” So, you stay quiet and you endure life without a reliable source of fresh water. Would this happen in the U.S.? Load-shedding: at scheduled times (not always on time), the power goes off for 2.5 hours or more at a time, in different areas of the country. There is more demand for power than the amount of power available from Eskom, the power company. For many, many years Eskom has been aware that the infrastructure will not be able to handle the increasing demand and for many, many years Eskom has said they are adding more power stations and are asking people to be patient. The projects are behind their scheduled completion dates and over cost. There are rumors and speculations that the whole country could go dark. It has been very hot here. Without electricity, there is no fan going, no refrigerator on, no overhead light to read by, no hot water in the kettle, no charging of devices and no TV. Abraham Lincoln did all his schoolwork (total of one year) by firelight. At least I have power sometimes! Good news (but ironic given the precarious state of power): this morning I heard from David Patient that his organization of rich Americans has agreed to give my school R20000 toward the electricity project! This amount is not enough to complete the electrification of my school. I cannot begin to get the money from YOU and other U.S. donors until after I attend the Peace Corps training in mid-April on how to do it within the Peace Corps bureaucracy. We need to practice patience! 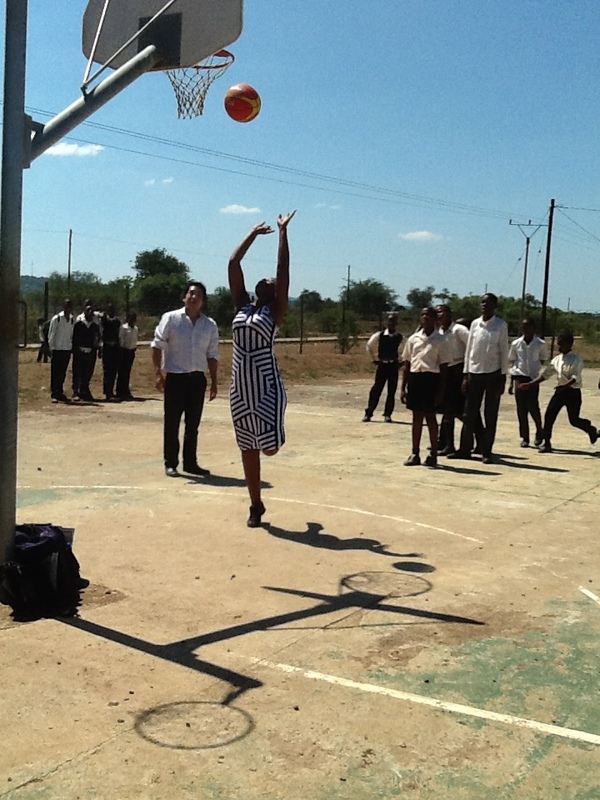 George, a Peace Corps volunteer, was teaching some learners how to play basketball. Here is Ma’am Gumede, one of our grade three teacher, attempting to make a basket. 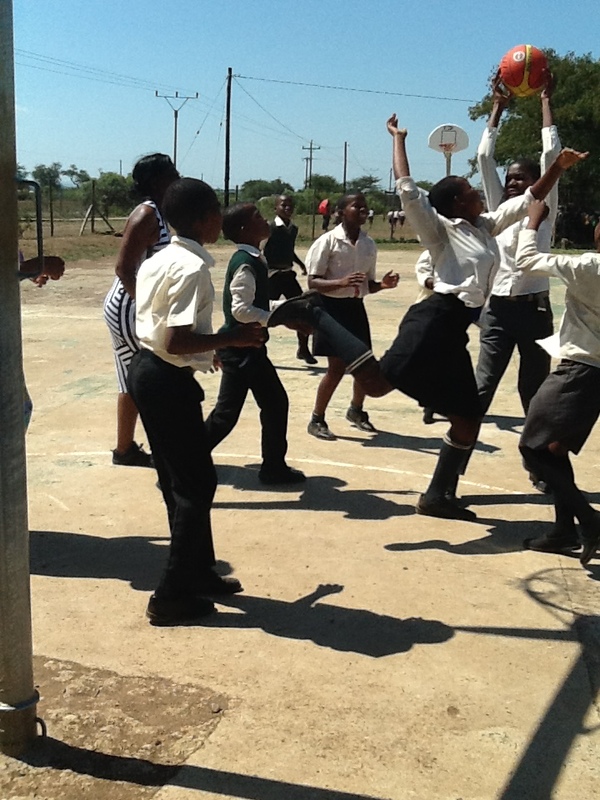 Here are the kids and a teacher practicing their new skills playing basketball for the first time. It is similar to netball, a game they know well, so they forget to do the new skills.